The decision of the Kumaraswamy government to reject the Kasturirangan committee on Western Ghats amounts to rubbing salt in the wound of the people of Kodagu who are yet to recover from the devastation caused by looting of the forests by the timber mafia hand-in-glove with politicians. Kumaraswamy who has already witnessed the death and destruction caused by the landslides and flooding in Kodagu (Coorg), should have the conscience to prevent such man-made disasters in future by implementing the recommendations of the Kasturirangan report to conserve the Western Ghats. It is quite possible that the chief minister was influenced by a powerful minister in his cabinet who is part of the Kerala timber mafia responsible for the loot of the forests in the Western Ghats. With the Lok Sabha elections due next year, the politicians may want to keep the timber lobby in good books to mobilize funds. The panel had suggested declaring 1,576 villages along the Western Ghats as ecologically sensitive areas (ESA), which would heighten conservation measures as well as place restrictions on certain construction activities that involve landscape changes. If Karnataka did not respond by August 25, the deadline set by the Centre, then the demarcations recommended by Kasturirangan Committee would be deemed as final. Kasturirangan report is the diluted version of the first report submitted by Madhav Gadgil in 2011. Kodagu Congress MLC Veena Achaiah whose coffee estate was wiped out by recent landslides, has been quoted as saying:“If we have made mistakes and taken nature for granted, then we must retract and accept what scientists say. It is the only way that we can save Kodagu from such natural disasters. Environmentalists have sought the implementation of the recommendations of the Kasturirangan report. Col. C.P. 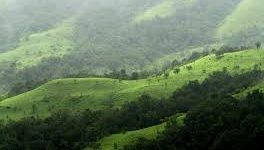 Muthanna (Retd), the President of the Coorg Wildlife Society, has demanded that entire Kodagu district should be declared as eco sensitive area to maintain the ecological balance in the district. Environmentalists K.M. Chinnappa and A. Thammu Poovaiah have maintained that the implementation of the report was in the interest of the people. They claimed that a few vested interests, politicians and officials were engaged in creating rumours against the report. It may be noted that Kodagu MLAs K.G. Bopaiah and Appachu Ranjan had not allowed even a debate on Kasturirangan report and sought its rejection outright by launching a disinformation campaign. Goons of the timber lobby had attacked S. Sivasankar, a young Indian Forest Service officer, posted as deputy conservator of forests, Madikeri wildlife division, at the Fort Hall in Madikeri a couple of years ago during a meeting over the recommendations of the Dr Kasturirangan report on Western Ghats. The attack occurred in front of the Mysuru MP, MLAs of Virajpet and Madikeri and Zilla Panchayat president of Kodagu. The incident was recorded on video by the district authorities. It is apparent that politicians cutting across party lines have been dancing to the tune of the timber lobby. So much so that a Kodagu bandh called by the BJP was supported by Congress, that too when a Congress government headed by Siddaramaiah was in power. It is baffling how the Congress party which was running the government can support the bandh as the shut-down is directed against the government. This gives credence to the suspicion that leaders of all political parties are hand-in-glove with the timber lobby. The only way is for the population of Kodagu to come together and carry on a peaceful protest. They must protest to ensure Kodagu is declared a Eco sensitive area, ban cutting of trees, drop plans for constructing the two national highways and rail link to Kerala through Kodagu.